Fences—Developed by Stardock, this Windows software creates translucent boundaries on your desktop that helps you to organize your icons. It offers the ability to customize your desktop. The user can double-click on the screen in order to hide the selected icons. A Pro edition allows you to create categories for the fences and there is also a free version available. Fences has over 3 million downloads. ObjectDock—Another Stardock product, this dock also comes in free and Pro editions and was offered for the last several Windows released. ObjectDock creates shortcuts for users in their docks and simulates Mac OS X in functionality. It is utilized as a program launcher or as a taskbar replacement and can be optimized by plugins for a variety of additional functions. A recent version supports Vista, a resources search engine, and improved features all around. RocketDock—PolyVector and Skunkie of Punk Labs released this application launcher under a creative commons license. Borrowing from ObjectDock’s Docket API, the animated, alpha-blended software can also be used to show updates of live windows. It is compatible with multiple skins, easily customizable and features multiple monitor support, unicode compliance, bilingual users, and positioning and layering options. Winstep Nexus Dock—A hot desktop customization utility, Winstep prides itself on its versatility, offering icons for a variety of functions, including CPU and RAM meters, time and date, and a Screen Capture Tool. There are also many options for tabs, the highlights of which are Position and Behavior, Appearance, Effects, and others. The newest version is enhanced by a weather module, new ‘launch’ and ‘attention’ features, a Flip3D command, and new language files. Winstep has garnered over 800,000 downloads and is considered a rising star. 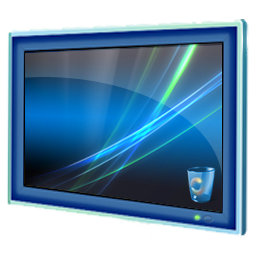 VistaGlazz—Simple but essential for Windows Vista users,VistaGlazz allows you to alter your Vista setup in whatever way you choose. With a basic, no frills interface and no skins to confuse you, this app will help you to configure your desktop so that it’s optimal to your workflow. The last download count had VistaGlazz inching closer to 2 million. These are the top picks for desktop utility software. They are by no means the only options, but for customizing your Windows desktop these five pieces of software can be extremely useful. Free Boss Key – Hide your inappropriate computing. Free Boss Key is a version of Anti-Boss Key with some limited features. Free Boss Key lets you hide and restore the windows (programs) from your screen with the press of a hot key or a mouse shortcut. It will cover all the tracks of the running programs by hiding them also from the task bar and the system tray. In addition to that Anti Boss Key will not close the applications but keep them hidden in the background thus preserving your data at the point of interruption. All you need to do when the threat has passed is to hit the bosskey shortcut again to restore your work at the point of interruption. In addition to all that the application can mute the sound, switch the display resolution (if you was playing a game), start (bring to top if running) an application (the one you are supposed to work with) and many more. Please take a look at the features list for more details. By hiding windows you have the freedom to protect your privacy and hide sensitive information from praying eyes. Developed by the best software engineers at MindGems Inc., Anti Boss Key perfectly fits in our collection of “MUST HAVE” software products. It is designed to work perfectly on a vast variety of operating systems and hardware configurations. Bosskey’s size is diminished to reduce memory usage without making compromises to the features in order to run without disturbing your usual work. It’s speed is brought to maximum to allow you react as quickly as possible to any threat that appears. You won’t feel even a slight difference in the performance of your home or office computer after installing it. Anti-BossKey will hide tray icons in the tray notification area. You get all of the above features in a single bosskey application that will help you to quickly hide windows and protect your privacy!